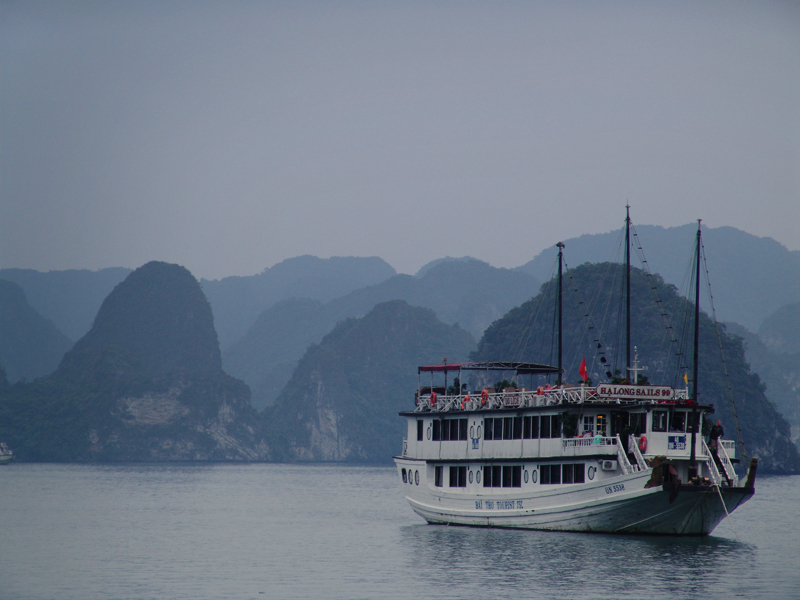 The Ha Long Bay circus starts long before boarding the boat, or even setting off for Ha Long city itself. Our plans to travel independently to Cat Ba island and visit the bay from there were scuppered by the week-long reunification day holiday and thousands of vacationing Vietnamese. In the words of one emailed guesthouse proprietor: “Don’t come this week, the room too expensive!”. So after a quick change of plans, we pressed on to Hanoi and started scouring travel agents. There are dozens of boats, packages and companies touring the bay and the choices are simply bewildering – almost as numerous are the travel agents in Hanoi’s old quarter that want to book the trip for you. On the cheaper boats, tales abound of rampant rats, inedible food and nickel-and-diming tour operators charging for everything that was supposedly “included”. Our creaking budget could never stomach one of the luxury, $500-per-night cruises; but we figured that this is something where you really get what you pay for, so we were happy to spend a little extra for something in the midrange (especially considering that Ha Long Bay is potentially the highlight of a visit to this corner of the world). Another consideration is the age of your potential shipmates – too expensive and you could be the youngest on a boat full of geriatrics, too cheap and it might be drinking games and (shudder) team-building activities on the beach. Further complicating the issue was our rapidly-looming visa expiration, meaning we had to leave now or potentially miss out on Sapa and the northern highlands. 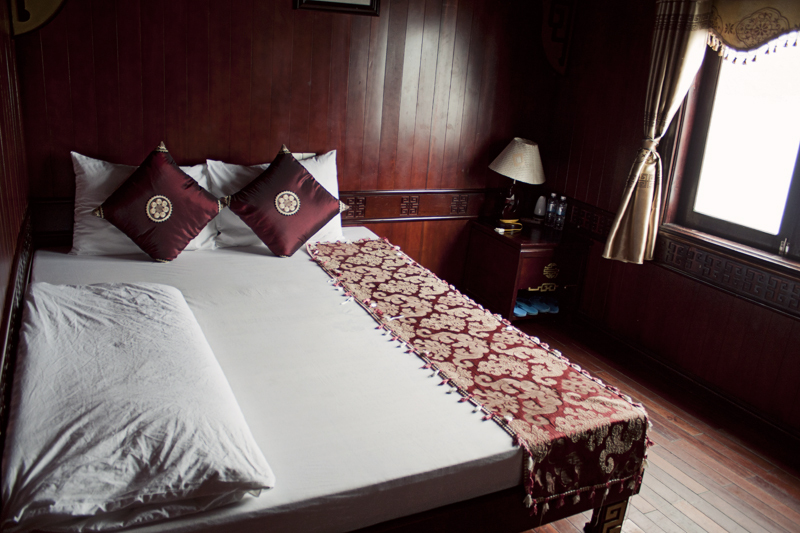 Having evaluated what felt like dozens of itineraries, brochures and reviews, we decided that one night on the bay would be far too short – the travel times from Hanoi are not insignificant – and we would prefer two nights on board a boat instead of splitting the time with a stay on Cat Ba island. Finally we settled on the “Dragon Deluxe” cruise, operated by APT Tours for a two-night, three-day trip at around $230 per person (with a slight “last minute” discount, apparently) and leaving the following morning. As an aside – we’re really not ‘guided tour’ people. Independent travel is faster, cheaper and generally just more palatable; but even with the acknowledgement that tours are sometimes a necessary evil – and can even turn out to be great fun – the phrase “Dragon Deluxe Cruise” sent shivers down both our spines. We departed Hanoi at 8am sharp and – the first good sign – were transferred to a full size coach for the trip to Ha Long City. A full size coach so brand new, that the plastic covers were still on the seats and floor, and the air stank of carcinogenic new car chemicals. Still, the journey was comfortable – if not particularly fast – and included a slightly bizarre rest stop at a garden statue factory. Four-and-a-half hours later, we arrived in Ha Long City and were quickly whisked by the company launch out to the waiting “Dragon Deluxe” junk. On board, we’re five westerners (the two of us, and three German chaps) and a few Vietnamese families. We are first served a welcome drink (Fanta), after which lunch is served in the dining room and the legendary mountains of Ha Long Bay loom through the windows almost immediately; albeit shrouded in mist and a light drizzle from the hard grey clouds overhead. We ate seven meals on the ship, and overall we were satisfied with the food. You don’t expect a gourmet experience but the tiny kitchen did a fantastic job of turning out dish after dish – rice, vegetables, seafood and meat. We were a little worried that our request of vegetarian food would either fall on deaf ears, or result in some plain rice and vegetables, but the kitchen produced several dishes specifically for us at every meal – there was the usual Vietnamese veggie staple of different fake meat products (rubbery, bland and simply unappetizing) but they surprised us with some freshly fried peanuts and corn (that was a new one! ), mock squid (formed from glutinous rice with a black bean “head”) and sweet potato croquettes. Our request to not eat eggs didn’t seem to get through, but it was not an issue and we were able to eat around the eggs that we were given quite easily. Portions were plentiful and served family style – we had way too much food – and while there was probably more fried food than we’ve eaten cumulatively over the last four months, any fears we had about food quality were unfounded. Beware though – none of the tours that we looked at include drinks, beyond a free water bottle in room and a tea or coffee with breakfast. Drinks on board are extremely expensive – at least a 200% markup – and those bought from the sellers on bamboo boats are not much cheaper. So consider bringing a few big bottles of water, a slab of beer, or whatever other contraband you might need to sustain yourself. After lunch we had a few minutes to check into our room and check out the boat. Our room was spacious and fairly well appointed – plenty of power sockets, a big window and lots of light, AC and an en suite bathroom (hot water and AC are only available with the ships’ generator, which means when it is parked for the night). There’s a slightly musty smell that pretty much comes with the territory, and while not exactly luxurious (the mattress is rock hard), it’s one of the nicer places we’ve stayed so far. A special mention to the shower which is steaming hot and has good pressure – a far cry from being yelled at by a Whitsunday island cruise captain for wasting fresh water by showering once on a three day trip. Overall the boat is fairly old, but clean and well maintained. The staff are friendly and helpful, and we would have been most happy to relax on the sun deck and simply take in the view as we moored at our overnight spot in the middle of the bay. That was not to be, as we were running late and the whole first day of activities was waiting. We were shuttled by the boat’s launch to our first attraction: the ‘surprising’ cave. The really ‘surprising’ thing was that, of the hundreds of visitors to Ha Long on that day, they all seemed to arrive at the cave simultaneously. 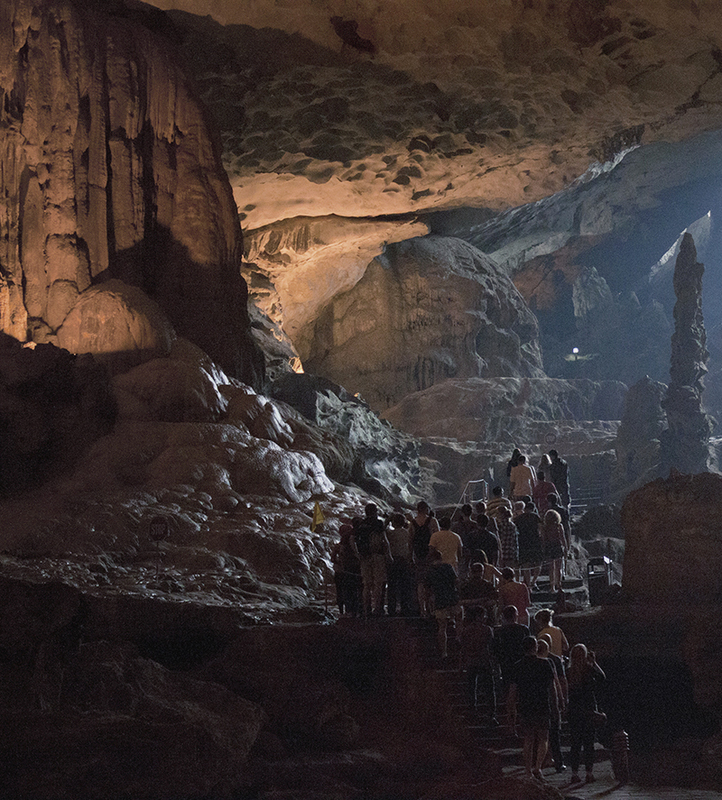 While somewhat interesting and really quite impressive, the cave couldn’t stand up to the grandeur of Phong Nha and we found ourselves annoyed and frustrated to be pushed and shoved around by a throng of wide-eyed visitors. Our guide was entertaining and had some fun insights, but we were happy to escape back onto the launch. Next stop was “Three Peach Beach” for swimming or exploring. Having surveyed the high level of pollution in the water – this is very close to one of the main overnight mooring points in the bay – we elected to make the steep climb up the hillside to take in a commanding view of the bay. 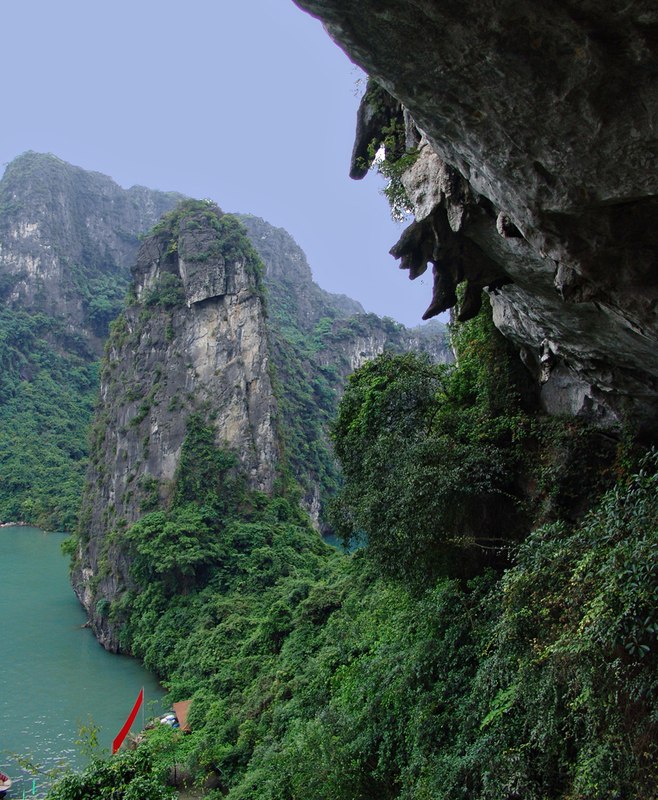 It really is breathtakingly beautiful, a 360-degree panorama of karst limestone mountains fading far into the distance. Sadly there was only enough time for a quick photo op before heading back down the hill to return to our launch (there’s a schedule to keep, here!). Finally, we return to the boat for the day’s final activity: kayaking. We’re running quite behind schedule at this point, but although the rain has stopped, the stiff grey clouds remain and there doesn’t seem like a chance of any real sunset. 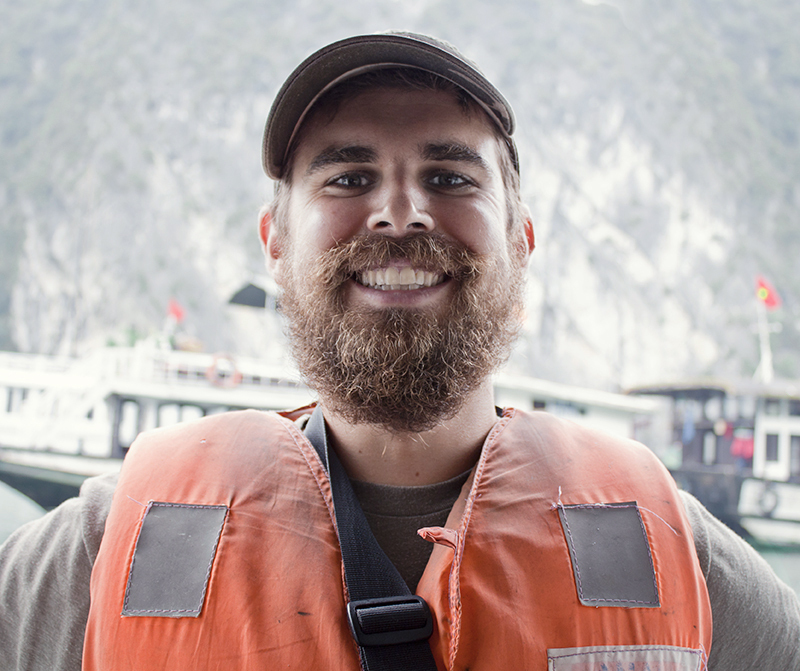 So we’re happy to set off and explore the caves and mountains close to our boat. By this point in the day, it’s starting to get dark, we’re a little tired and fried after an afternoon of being rushed around and the beauty of what we’re seeing gets a bit lost. We happily return to the boat and try to take it all in, but before dinner it’s one more activity – a cooking class. A quick demo of how to make a spring roll, with an explanation of the ingredients, and we’re stifling laughs as the chef splits his rice paper on attempt number one. Another sheet of rice paper and it’s all fixed, and then we all get to try. The irony of teaching a largely Vietnamese crowd how to make a spring roll is not lost on us. Next up – a tomato carving demonstration. It’s incredibly cringe-inducing as the chef is clearly feeling the pressure of dozens of eyes on him – his shaking knife makes us wince in fear of his thumb as he messes up the first tomato. But on attempt number two, and after a few mistakes, he produces a pretty fair representation of a swan, and then a tomato rose. Some broken applause follows, and we settle down for dinner. After dinner is free time, but there are some optional activities: nobody (fortunately) seemed up for karaoke, so we tried our hand at squid fishing. Concerns over actually catching a squid – something difficult to reconcile with being vegan – were quickly abated when it became apparent that the squid weren’t biting. Whether it was due to insufficient equipment or technique, or maybe it’s simply an activity designed to keep the kid’s quiet, there were no squid to be had. However the real fun was in laughing and joking with our German shipmates over fishing rods and cold beer. Day two and after breakfast, we all go our separate ways. Most people are on the one-night cruise, and they head back to shore. 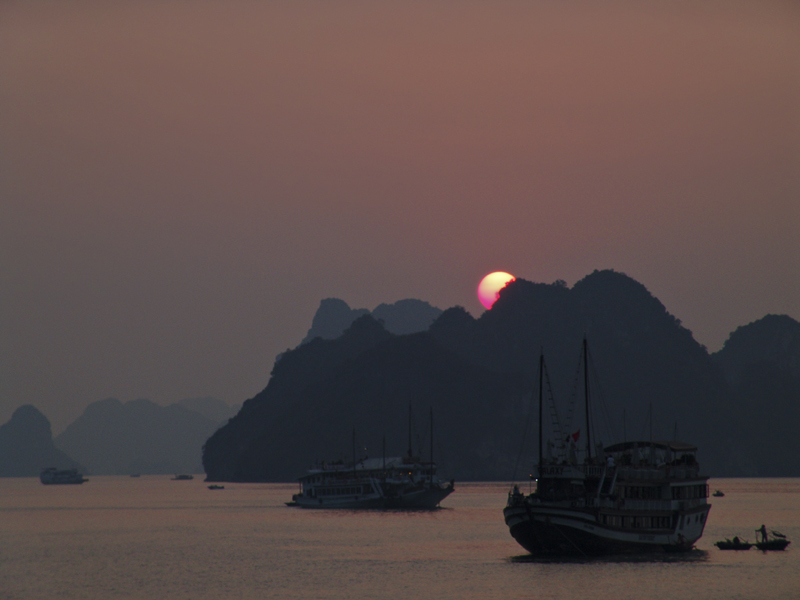 Some are off for a night on Cat Ba island, and they take another boat. 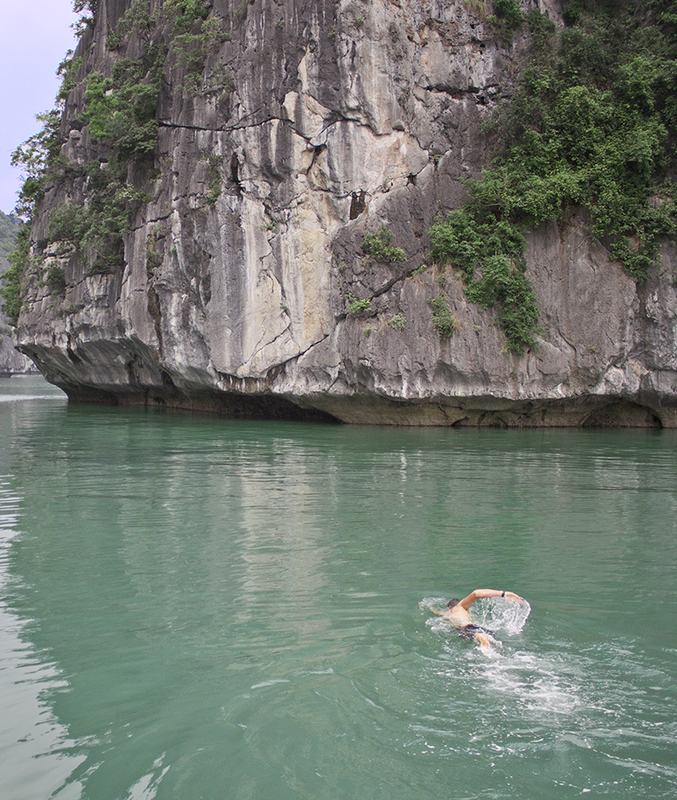 We are to spend the day kayaking and swimming in Lan Ha bay, so as a smaller launch whisks us away, we were left to ponder the logistics of a Ha Long bay cruise: shuffling people, boats and buses – all on different itineraries – must be no small task, but our guide never seemed confused. 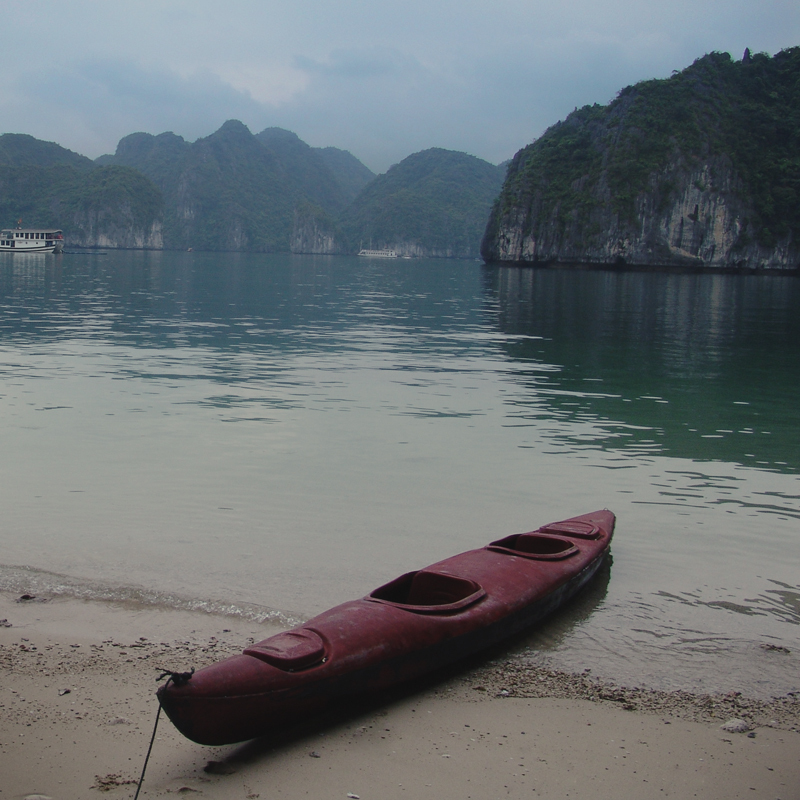 We shuttled around the different boats collecting our fellow tourers – Vietnamese, Korean, Mexican and Saudi Arabian. 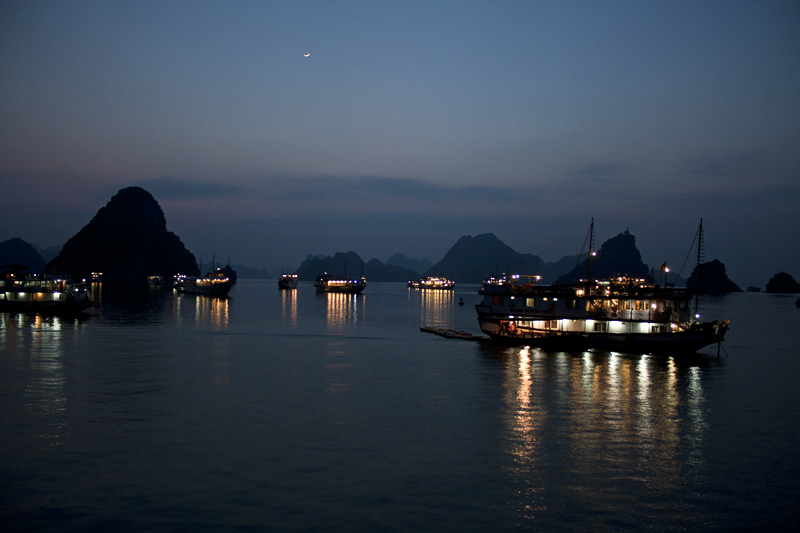 There are dozens of cruise ships moored with ours – one of four main overnight mooring spots in the bay, each with twenty to fifty boats – which should give you some idea of the scale of the Ha Long operation. 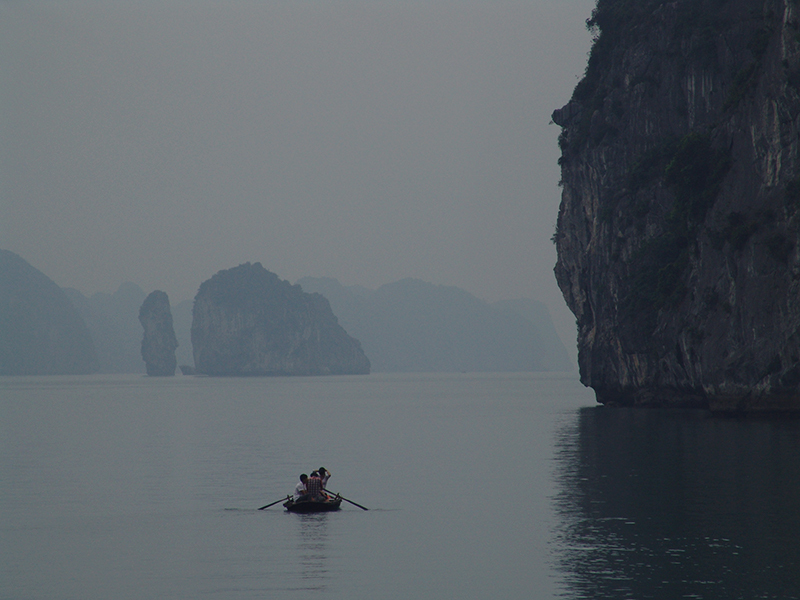 But we were heading to Lan Ha bay, Ha Long’s quieter, less visited sister. 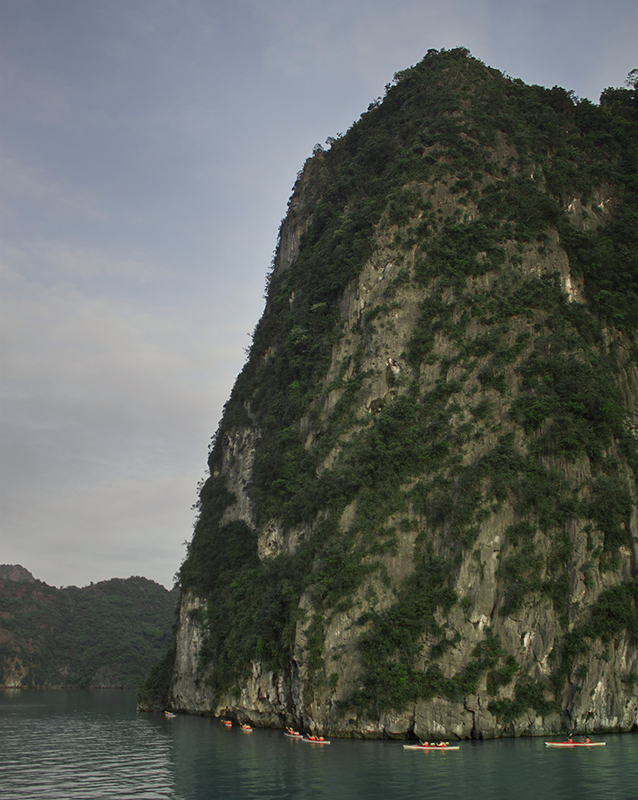 Lan Ha is no less beautiful, although the scale is smaller – the islands aren’t quite as panoramic. Still, as we set off on a guided kayaking trip, we couldn’t have cared less about that – the view is stunning. A still-grey sky and light drizzle didn’t dampen our spirits as we kayaked through caves, into an isolated bay right in the centre of one of the karsts. The only sounds are the splash of our paddles in the water and the haunting noises of birds and monkeys in the surrounding forest. This was the highlight of the whole trip: peaceful, beautiful and exotic. A significant downer is that the water is heavily polluted with plastic waste. Kayaking to and from the boat we were calling out “toothbrush… comb… plastic bag… child’s toy”. There are large slicks of diesel and other chemicals clearly visible in the mooring area for the cruise boats, as well as on the way to and from Ha Long city. There is also a lot of visible food waste. Returning to the launch, we sailed to another part of the bay and took the opportunity for a quick swim before lunch. The water was less polluted here, and after deciding to keep our mouths firmly closed, the call of a refreshing dip was too much. 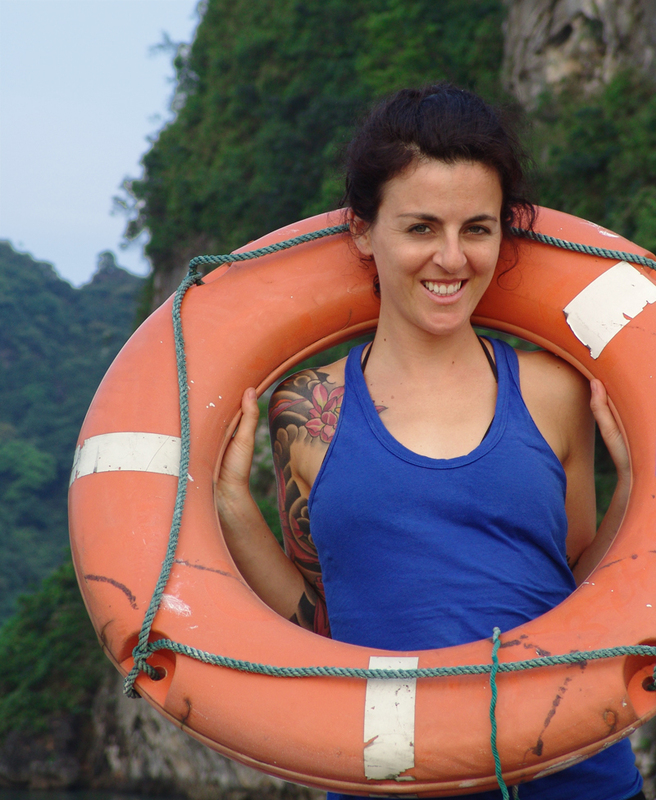 Again, it was magical – swimming alongside the mammoth cliff faces to explore a deserted beach and back again, we felt like real adventurers. After lunch, we had the option to swim, kayak or simply take a nap on deck. 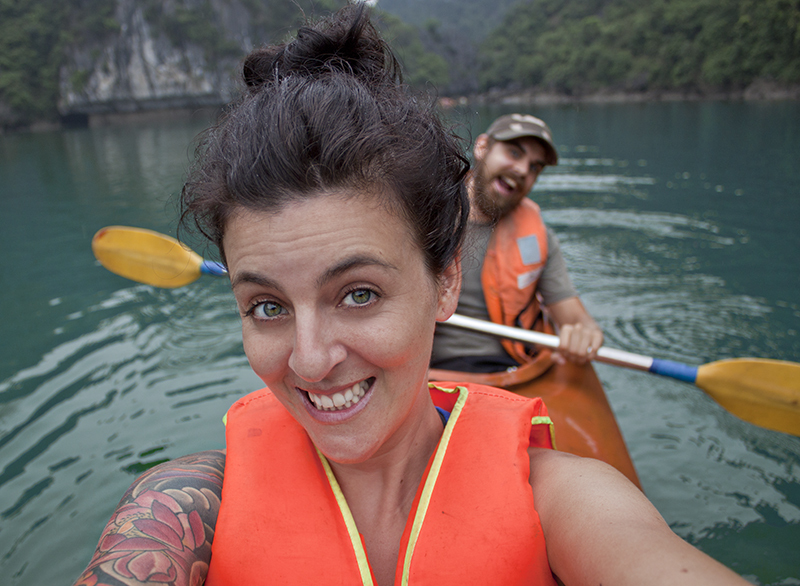 We leapt on the opportunity to get back in the kayak and explore properly, without the distractions of cruise ships and drink sellers. It’s simply fascinating to paddle so close to, in and around these mountains with their hidden caves and beaches. We could have spent the whole day doing just that and left with the firm (yet probably fleeting) resolve to purchase kayaks immediately after returning to Canada. Cruising through the bay once again, we passed through a floating fishing village for a quick photo opportunity. What a strange life for these people – for over a century, they’ve lived and fished here, rarely setting foot on dry land – and several times a day, ships full of tourists pass right through – never stopping, snapping pictures, waving and toasting them with cocktails in hand. Despite the pollution, the bay appears to teem with wildlife. Sea eagles circle overhead at all times of day, swooping down to catch the fish that we can see everywhere in the water. At one point, a long, thin fish flies out of the water and surprises us by skipping along it’s surface for several meters. Butterflies flit past us on the sun deck, and a huge variety of birdlife is startled out of hiding by our gently kayak paddling. The final stop of the day is the Ha Long pearl farm. Despite feeling like a clear ‘filler’ on the schedule, it was surprisingly interesting and – surprisingly for a country that never misses an opportunity to sell crap to tourists – there was no pressure to buy jewellery at the end. The guides were funny and well-informed, and we got a very close look at the pearl farming industry. Dropping us back at our boat, little did we know what a highlight was waiting for us. The new tourists – those arriving from Ha Long city – had not yet returned from their day one activities, leaving us alone on our private junk. Stepping aboard felt a little like arriving on the Mary Celeste. The sky cleared for the first time since leaving Hanoi, and we were able to relax on the sun deck and watch a truly beautiful sunset. The throng of cruise ships, which at times can look like an invading navy, faded into sheer silhouettes, bobbing in front of the mountainous landscape. It was an epic sunset and the cap to a fantastic day. Day three’s activities consisted of a return to the pearl farm for our new arrivals – which we were able to skip in favour of some on-deck relaxation. We started the cruise back to Ha Long city – the sun peeking out from behind the clouds once more, and giving us one last look at this spectacular landscape – and after lunch, got shuttled back to shore and then onto buses for the return ride to Hanoi. Of course, with the obligatory stop to buy garden ornaments. On reflection, taking the two night tour was the best thing we could have done. The first day’s activities were rushed, and simply felt unnecessary; when all we wanted to do was take in the magnificence of the bay. 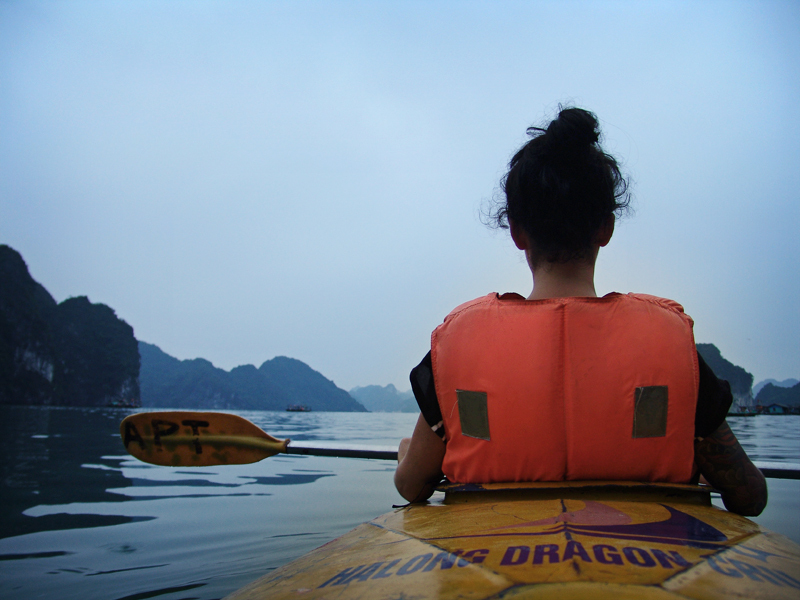 Kayaking and swimming in Lan Ha bay, at our own pace, and having the time to simply absorb what was around us from the deck of our ship were what we really came for. Without that, I surely would have left feeling that we missed out; the journey to and from Ha Long city and organized activities only give a flavour of what there is to see. 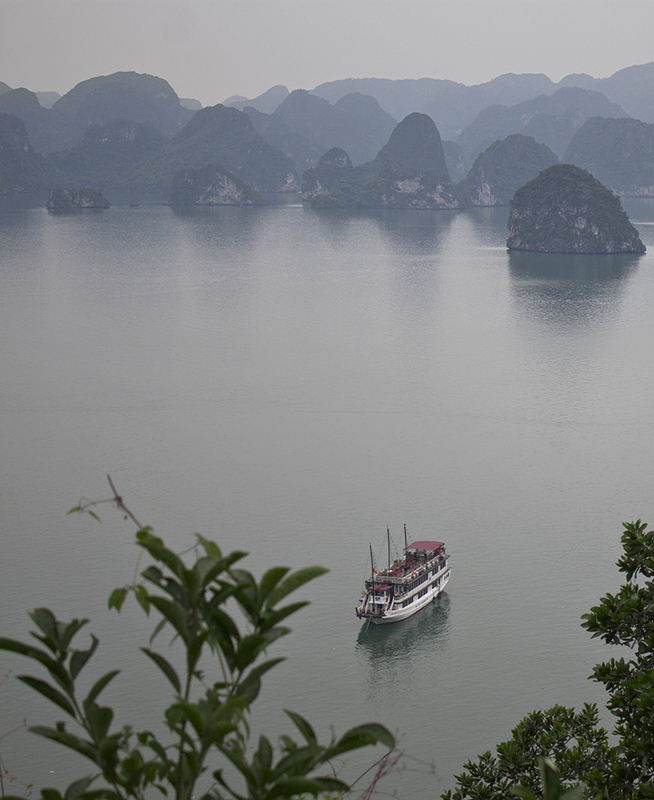 Have you been to Halong Bay? How was your experience? 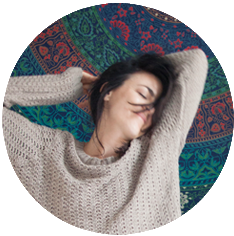 This entry was posted in Asia, Travel, Vietnam on May 30, 2014 by Amélie. 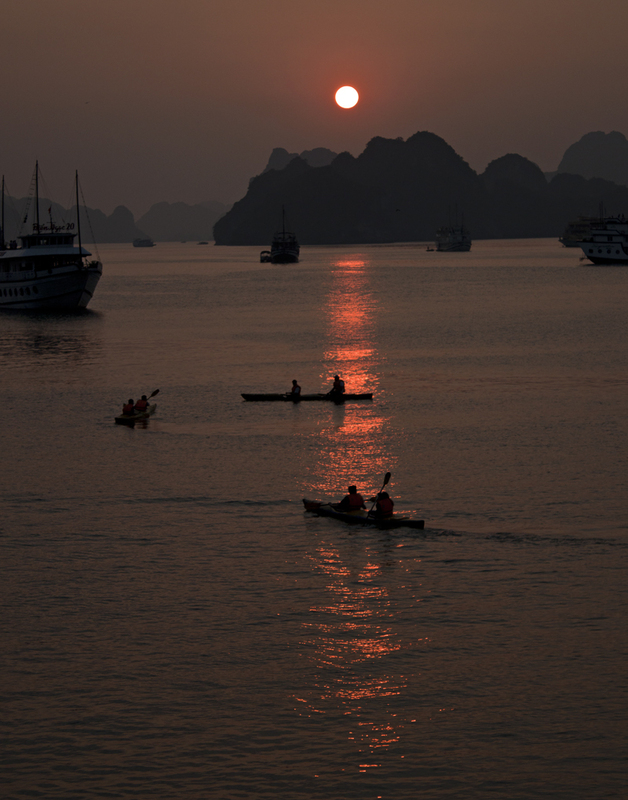 NIce post.You are showing the different view of Halong Bay cruise.The pictures are given more interesting it. The video clip provided a different experience i like it very much. The pictures of the sunset are really beautiful. 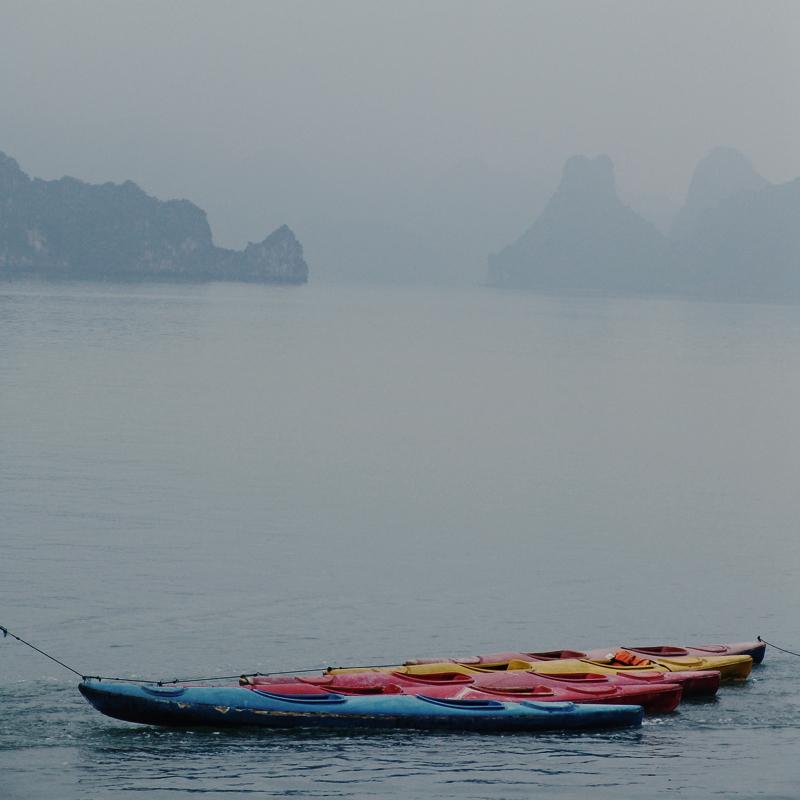 The trip to Halong bay was just like a dream trip. Really a awesome place to visit . At least once to visit in whole life.. 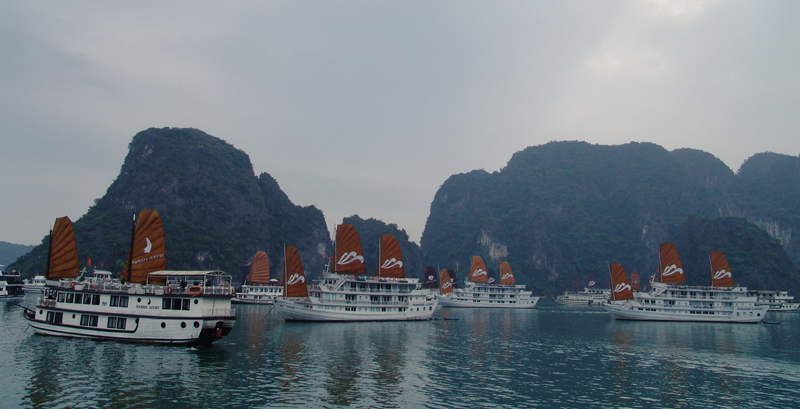 Hoping for a Cruise trip at Halong bay….